Zombies are quiet creatures. They're best known for shuffling silently, arms extended and mouth agape. Sure, they'll let out a solid "Braaaaaiiinns" once they've spotted a victim, but that seems to only counterpoint their normal low-decibel emissions. Rattling a cup is definitely not their style. 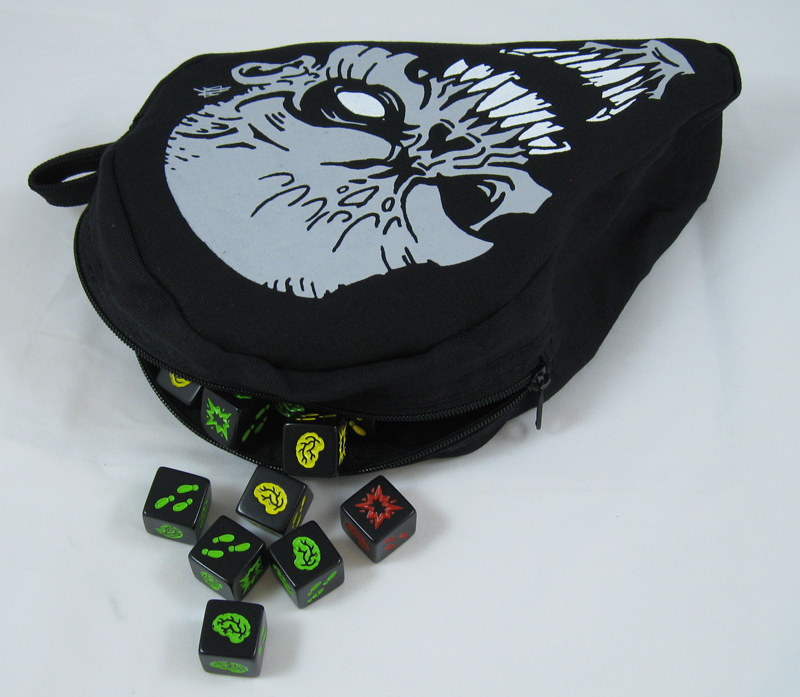 With all this in mind, Warehouse 23 presents an upgrade for your Zombie Dice game: the Zombie Dice Bag! Sturdily stitched and with a wide zippered mouth, this bag is perfect for carrying your game as well as drawing dice out of. It's decorated with both the Zombie Dice logo and Alex Fernandez's awesome zombie head . . . and a loop to easily attach the bag to a backpack or belt. Of course, the bag is large enough for many, many more dice than the 13 that come with ZD or the dice that come in the expansion . . . oops, did I mention the ZD expansion? Forget I said anything. The point is that while the Zombie Dice Bag is the official bag of Zombie Dice, it is also an excellent dice bag for people who like zombies! Zombie Dice Bags are available exclusively through Warehouse 23!